Jamieson’s TrusTrac™ gates are a premier line of aluminum cantilever sliding gates. Utilizing our proprietary truck and enclosed track system, this single panel gate can span large gate openings with minimal deflection or resistance. All gates are fabricated and fully welded under factory controlled conditions, ship ready for immediate installation¹ and include all hardware for manual operation. 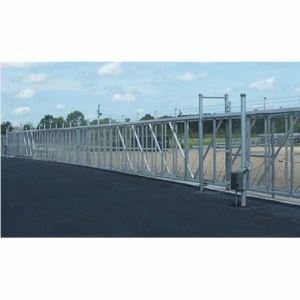 ¹ Where the overall length of the gate exceeds shipping constraints, the gate is shipped in two sections with prefabricated splice provisions for simple reassembly at the job site.